KUNDUZ -- Grieving the death and destruction the Taliban inflicted during the recent parliamentary elections in Kunduz Province, residents and local officials are condemning the militants' savagery. On October 20, election day, Taliban militants stormed a makeshift polling station at a school in Kunduz, killing an Independent Election Commission official and two policemen, before setting the building ablaze, according to local media. 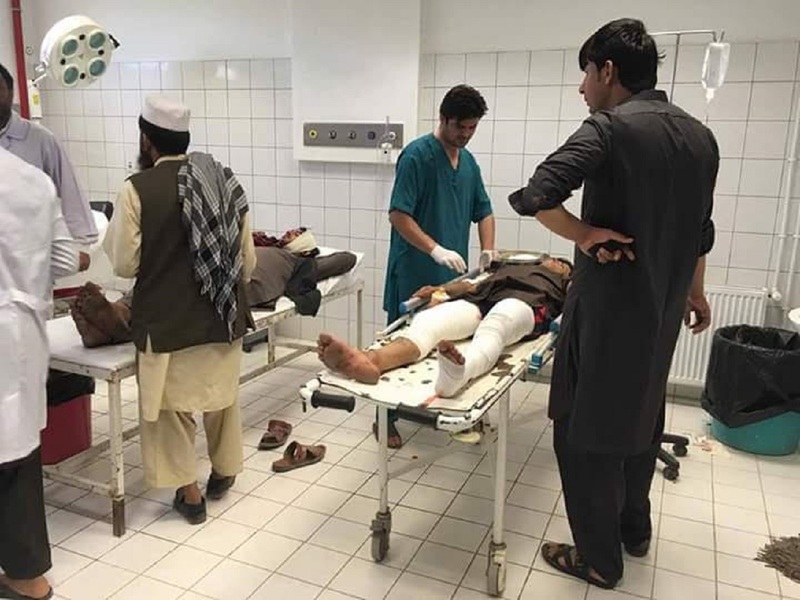 Several rocket attacks were also reported in the province throughout the day, causing at least 39 injuries, according to Dr. Marzia Salam Yaftali, director of the Kunduz Hospital. A video screenshot shows residents of Imam Sahib District, Kunduz Province, October 22, as they visit their houses destroyed by the Taliban militants during the October 20 parliamentary elections. Residents blame the militants for hiding out in the houses. Taliban insurgents also hid in civilians' houses, forcing residents to flee for their lives. 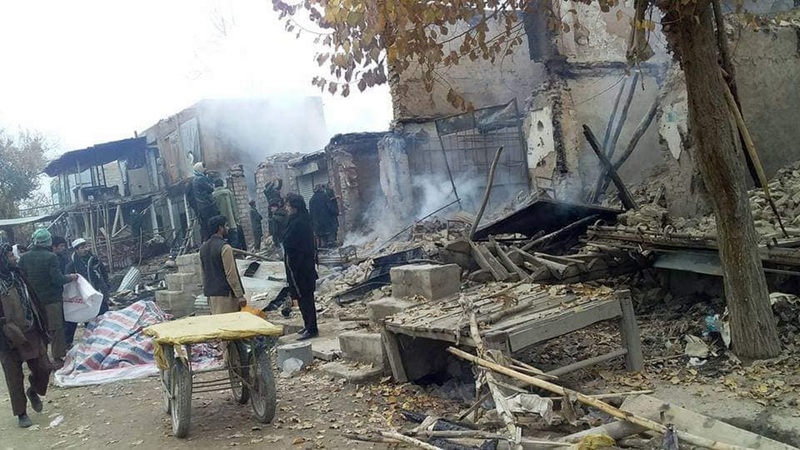 "It is a cowardly act to kick civilians out of their homes and use houses as their barricades," said Kunduz provincial governor Abdul Jabbar Naimi. Clashes between the Taliban and Afghan forces resulted in the destruction of or damage to more than 50 houses, according to local officials, who cited the killing or wounding more than 100 civilians. "This barbaric group, with their savage mentality, fired upon and shelled all of Afghanistan, especially Kunduz, on election day," Naimi said at an October 25 prayer ceremony in honor of the late Gen. Abdul Raziq in Kunduz cfity. Meanwhile, a suicide bombing on election day killed 15 Afghans and wounded 60 others in Kabul, while several other explosions and shootings in the city killed three and wounded 25, according to Mohibullah Zeer, the acting spokesman for the Health Ministry. Similarly, two civilians were killed and several others wounded in Nangarhar Province, where the "Islamic State of Iraq and Syria" (ISIS) has had a strong, but diminishing, presence. In Baghlan Province, three mortar shells killed four Afghans and wounded several others, while at least 10 civilians were wounded in Kunar Province. Militants killed at least 10 parliamentary candidates in the run-up to the vote, along with dozens of their supporters, across the country. The Taliban are conducting these attacks at the time when the hopes of the Afghan people for peace negotiations with the Taliban have revived, Naimi argued. Thousands of religious scholars who gathered in Saudi Arabia, Indonesia and Kabul over the past year have declared the war in Afghanistan "un-Islamic," he argued. The Taliban showed "weakness" in using civilians as human shields in Kunduz, he said. "We strongly condemn this brutal act, which has left hundreds of families mourning their loved ones whom they lost on election day." Local residents also condemn the Taliban for using civilians' houses as trenches and barricades and for destroying mosques. "Lives have been ruined and destroyed, and civilians have lost their livelihoods and places of residence," said Ehsanullah Khatib, 55, a resident of Imam Sahib District in Kunduz. "The Taliban killed many through mortar bombardments while making many others homeless." "A mosque was destroyed, and many sacred books were damaged," he told Salaam Times. "At least 50 houses have been destroyed, and many residents lost everything," Sayyad Hassibullah Omari, 45, another resident of Imam Sahib District, told Salaam Times. "Taliban militants moved into civilians' homes, following which Afghan forces inevitably carried out aerial and ground attacks on the militants, where the civilians sustained losses," he said. "The Taliban is the main culprit and the source of civilian casualties and financial damages," Omari added. Mohammad Yusuf Ayubi, chairman of the Kunduz Provincial Council, who recently visited the district as part of an investigative team, confirmed the damages. More than 50 houses were destroyed in the villages of Makhmal Kucha, Aqi Bai, Rawza-e-Mubarak, Khaksar Mina, Naw Abaad and Chaharrahi Emamuddin, and dozens of others were damaged, he confirmed. Ayubi condemned the Taliban's targeting of civilians. "Civilians are the ones who ultimately suffer in most of the attacks by the Taliban," he told Salaam Times. A delegation comprising the directorates of Rural Rehabilitation and Development and of Refugees and Repatriations, as well as the National Disaster Management Authority and the Red Cross, visited Imam Sahib District in order to survey the stricken areas, Imam Sahib District Governor Mahbubullah Saidi told Salaam Times. The delegation will identify the victims of recent clashes in the area and will provide them with cash, food and non-food aid, he said, without elaborating on when exactly the aid will come. "The level of catastrophe and calamity in Imam Sahib is much higher than what we had imagined," he said. "Those who suffered damage and became homeless are extremely poor," he said, adding, "The Taliban should not seek shelter in civilians' houses." "In addition to houses being destroyed, a number of residents in Imam Sahib District were martyred by the Taliban," said Khaluddin Hakimi, a member of the Kunduz Provincial Council and a resident of the district. "One of my brothers, two of our neighbours, a little girl and an elderly woman are among those killed," he told Salaam Times.